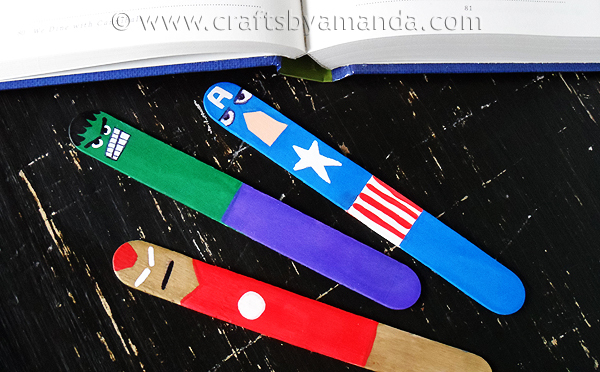 Kryptonian Warrior: The Avengers Craft-Time: Lollipop Stick Bookmarks By Kryptonian Warrior! 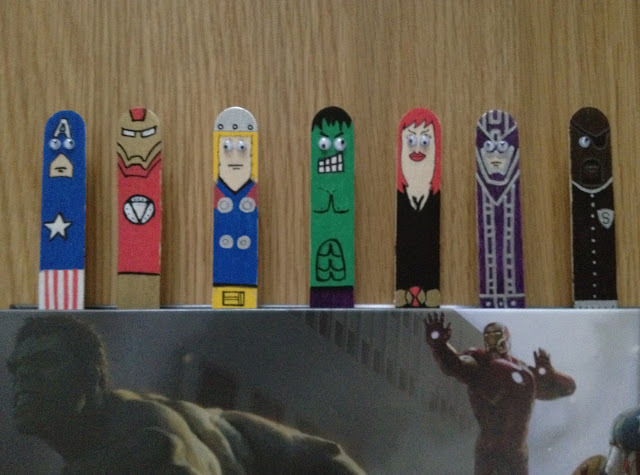 The Avengers Craft-Time: Lollipop Stick Bookmarks By Kryptonian Warrior! A few weeks ago I posted up a pic in "Cool Pics From The Web" which featured an Iron-Man, Captain America & Hulk set of lollipop stick bookmarks from "craftsbyamanda.com". Last night I got bored and attempted my own versions... I must stress that these are all first-tries with numerous issues like wrong colours, inability to match the movie versions, mistakes whilst colouring etc. But my kids loved them and they were fun to do. I'm thinking of adding more Avengers to the roster and maybe even attempting some X-Men and Justice League versions. My youngest has already commissioned me to do a Supergirl and my eldest a Wonder Woman version for their school books!